Kusumlata Bisht, an accredited social health activist in Uttarakhand, India, demonstrates mSakhi on her mobile phone. Photo by Akbar Khan for IntraHealth International. This week, we’re featuring stories from frontline health workers all over the world. It’s just one of the ways we’re celebrating World Health Worker Week 2018. There’s nothing typical about Kusumlata Bisht. At 40 years old, she is a frontline health worker who has beaten overwhelming odds to find success. Kusumlata became an accredited social health activist (or ASHA) in 2007. These frontline health workers reach rural communities—and mostly pregnant women, mothers, and children—with preventive health services and information on nutrition, diet, and vaccinations. They are a critical link between rural communities and the formal health system. As part of her work in the verdant mountains of rural Uttarakhand, Kusumlata has already helped 56 pregnant women plan for institutional deliveries, including escorting them to the hospital; provided assistance at nine home deliveries; and even followed up with two people with severe tuberculosis to make sure they were adhering to their treatment properly. Kusumlata comes from a poor family—the government had classified them as living below the poverty line. But she has mustered the courage not only to help rural women live healthier lives, but also to use the income from her role to support her own family. This has brought respect and increased support to the health workers within their families also. Now my whole family is interested in how mSakhi works. In matters of health, Kusumlata is as much a support to her own family as she is to her village. Her husband is physically disabled and needs ongoing medication for his treatment. He is unable to work outside the home. Kusumlata is also a mother of three, and her eldest daughter has hearing and speech impairments that prevent her from going to school. Despite the needs at home, Kusumlata has ensured her other two children receive a proper education. Her younger daughter is graduating from college this year, and her son is in Class XII about to complete senior secondary school. To assist with her job, Kusumlata was issued a smartphone by IntraHealth with the mSakhi app. mSakhi, which means friend in Hindi, helps ASHAs and other frontline health workers register pregnant women, plan vaccinations for infants, provide family planning advice, and register new births. It also replaces the cumbersome paper-based registers ASHAs have used to maintain records of families, women, and children. mSakhi is supposed to make health workers’ lives easier. 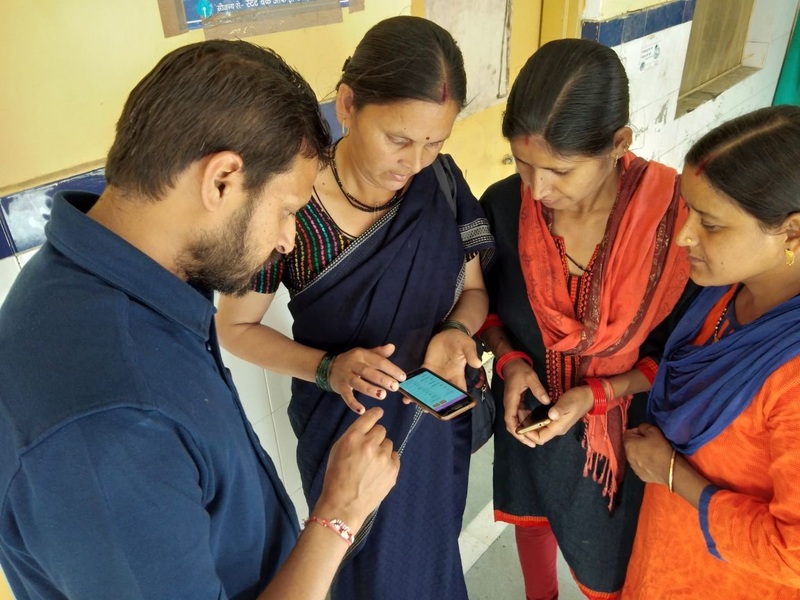 But, initially, managing the smartphone posed a challenge, as Kusumlata and many other frontline health workers in Uttarakhand had never used this type of technology before. But it has come to be a blessing. As Kusumlata and other ASHAs undertook more trainings from IntraHealth in how to use it, their confidence grew. Now mSakhi is both helping them do their jobs and raising their profiles in their communities and families. "The IntraHealth team has put in their best efforts to not only help us understand smartphones, but also build our knowledge in the field of health,” Kusumlata says. “This has brought respect and increased support to the health workers within their families also. Now my whole family is interested in how mSakhi works. My husband also helps me in using the smartphone better." Kusumlata is looking forward to bringing health services to many more families in her community—and to helping her own family thrive.